I'm currently reading Immortally Yours by Angie Fox. Not a cozy mystery, it's a paranormal romance. It's the first of the Monster M*A*S*H series. The setting is a Mobile Army Surgical Hospital Unit in Limbo. Doctor Petra Robichaud meets her match in Commander Galen of Delphi. Joined by a vegetarian werewolf, a moody vampire, and a priest with a pet hellhound author Angie Fox brings us both passion and humor. I actually won an autographed copy of this book! I'm loving it! Most cozies have a bit of romance in them. That annoying detective just may become a love interest. That vexing archeologist might become a husband! I freely admit that I enjoy reading romance novels. I also enjoy the sparks of romance found on TV. Therefore, I appreciate literary love…and lust. I also admit to falling for fictional characters: Edward in the Anita Blake Vampire Hunter novels (no, NOT the sparkly vampire), Severus Snape in the Harry Potter series (admittedly helped by Alan Rickman’s film portrayal), and Roger Lococco in the TV series Wiseguy. It should be no surprise that I’m also drawn to some of the guys we meet in our cozy mysteries. Here is my list of the top 4 cozy mystery guys with whom I’d like to be involved. 1. My first choice has to be Sailor from the Witchcraft mysteries by Juliet Blackwell. Sailor is a dark mysterious man who at first appears unapproachable, angry, and dangerous. And yet there’s something else. As much as he pushes you away, you want to get closer. There’s something wounded about him. You want to discover his secrets. 2. Kate Carlisle gives us two great candidates for this list from her Bibliophile Mystery series. We first meet Derek Stone, British security officer and former member of the Royal Navy and British Intelligence. He’s tall, dark, and handsome. As delectable as Derek is, Gabriel is the guy that makes my list! Is he a thief? A con man? Or a hero? He certainly shows up when least expected, and most needed. Gabriel is another man with secrets, secrets I’d like to uncover first hand. 3. Another Gabriel makes my list: Private Investigator Gabriel Striker from the Beaufort & Company Mystery series by Mary Stanton. Although he certainly fits the bad boy image this Gabriel is definitely not bad-he’s an angel after all. 4. My final choice is a bit different from the above mentioned dark and dangerous bad boys. But he’s no less enigmatic. Nancy Atherton writes a kinder gentler cozy in the Aunt Dimity Mystery series. She also gives us Kit Smith. Kit first appears in the 5th book in the series, Aunt Dimity’s Christmas. We find him, an apparent vagrant, near death in the snow covered bushes by Lori’s cottage. We eventually discover that Kit has an almost otherworldly goodness. With violet eyes, a melodious voice, and a face of utter beauty, his outside isn’t bad either! When it comes to fictional characters I guess I have a thing for bad boys. However, they’re all bad boys with hearts of gold! I'm currently reading Bowled Over. This book is the second Vintage Kitchen Mystery by Victoria Hamilton. I enjoy this series set on the American/Canadian border. I also really enjoy all the vintage cooking items, especially the cookbooks! At the Fourth of July festivities Jaymie once again finds a body. Unlike good hearted Jaymie Leighton I was very happy that the murderer killed this victim. I don't know who did it, but I know they had a good reason! I'd like to welcome Cathy Ace to the blog today. Cathy writes the Cait Morgan Mysteries. The Corpse with the Golden Nose is the second in the series, following The Corpse with the Silver Tongue. In this outing Professor Cait Morgan attends an exclusive gourmet event in British Columbia's wine country. Kathy: I am so lucky in that I live in the heart of New York Wine Country. Three different viticultural regions are a stone throws away from me. I take full advantage of this proximity going to different wineries for tastings and events.A setting in British Columbia wine country is of obvious interest to me. What can you tell us about the wines and wineries of this region? CA: The Okanagan viticultural region is the northernmost "serious" wine producing area in the world, and it is Canada's oldest. Originally making wine for religious uses using largely north American stock to grow a small variety of grapes, the 1980's saw a lot of changes. "Old country" stock was introduced and the numerous micro-climates in the region allow for many different varietals to be grown. Now producing a wide range of single grape and blended wines around the chain of lakes that stretch over 125 miles from Salmon Arm in the north to Osoyoos in the south, right on the Washington State border, there are about 200 wineries, numerous hotels and B&B's as well as an ever growing number of wonderful restaurants, which often specialize in creating meals from locally grown produce. This is possible because the Okanagan is also famous for its fruits, vegetables, and herbs, as well being close enough to the coast to have access to world-class wild Pacific salmon, as well as many fish from the clean rivers in the area, and some excellent grazing land for all sorts of livestock. The wineries might have tiny, homey tasting rooms, or grand, well-developed public properties, including golf courses, concert arenas and offering many classes in horticulture, viticulture and crafts. Kelowna is the main city in the area, and it offers access to long sandy beaches on the lake, as well as a vibrant cultural and sporting life. Kathy: I enjoy all sorts of wines, but my favorite is Gewurztraminer. Do you have a favorite? CA: I’m a red grape girl! Other than champagne, which, in my case is a given, Mt Boucherie Family Estate Winery produces a delightful Blaufrankish, which pairs well with any food, a rich Melange Noir, for steaks and spicy foods, and a light Gamay Noir, which I pop in the fridge for summer evenings. Kathy: Cait is a foodie. Are you a foodie too? If so, do you enjoy cooking yourself, or just enjoying the culinary delicacies of others? CA: I think that, like Cait, I'm a fledgling foodie, more of a gourmand than a gourmet, but, also like her, I enjoy eating adventurously and lavishly when I have the chance to do so. However, I also love to be in the kitchen. Every meal I prepare is from scratch, though I don't make my own pasta (I've tried, with disastrous results!) or bread (ditto!). I think the most important ingredients in a kitchen are salt, butter, wine and love. CA: All my Mum's fault! She encouraged me to read Nancy Drew, the Hardy Boys, and Enid Blyton's Famous Five and Secret Seven series when I was young, then, aged about ten, I was allowed to "graduate" to her collection of Agatha Christie, Ngaio Marsh and Dorothy L Sayers books. Those authors' works are my oldest friends. CA: Having published nine under-grad and post-grad marketing textbooks, I much prefer what I do now! That said, in my collections of short stories and novella, I have also written police procedurals (Detective Inspector Evan Glover cases) and madcap PI tales (The Ladies of the WISE Detective Agency). I enjoy writing the Cait Morgan Mysteries, but, if I have the chance, I'd like to be able to take my other characters on some more adventures of their own in the future. CA: Welsh Canadian Cait Morgan is a single, middle-aged professor of criminology at the University of Vancouver who specializes in victim profiling. She's able to use her incredible memory, her ability to read people and her psychological training to solve crimes which, sadly, present themself to her when she'd really rather be over-indulging in her foodie pleasures. She likes to travel - which is surprising, given what happens to her when she does. 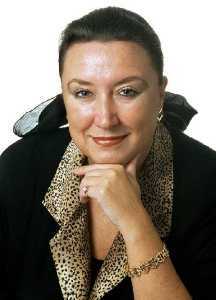 My books have been likened to “Christie or Marsh with a bouquet of Kinsey Millhone” (Globe & Mail). CA: I like Cait. She’s feisty, and somewhat bossy, yet vulnerable. She's far from perfect: she's got a bit of a checkered history when it comes to relationships, so has become highly self-reliant and doesn't see her own faults as quickly as she sees those of others. She shares many of my own shortcomings – but I’ve given her some of her very own as well. CA: I'm Welsh Canadian, and I love to travel, and eat and drink as I do so...all I did was throw in my love of closed-circle mysteries, add a few quirks that are NOT my own, and Cait was born. CA: My Mum and Dad were very proud when my textbooks were published, and were over the moon when a short story I’d written was produced for BBC Radio 4 in the UK. When my Dad died I realized that I wouldn’t have forever to do what I wanted, and, coming from the generation I do, I suppose I thought that “traditional publishing” was something to which every writer aspired. I self-published two volumes, used them to try to interest a publisher (my second attempt worked) and then, on May 11th 2011, which would have been my late-father’s birthday, I was offered a contract. CA: Agatha Christie, Arthur Conan Doyle, PD James and JRR Tolkien. If Shakespeare were to drop by for dessert, I’d pull up another chair . . . or stand up myself and let him sit. CA: I’m not, because I’m writing. I cannot read when I’m writing – I even find the newspaper a challenge! The last book I read was “The Complaints” by Ian Rankin, and I have “Death Comes To Pemberley” by PD James ready for when I have finished writing this book. CA: I’m an avid gardener. We live on five acres and garden a lot of it. Living in a climate that’s relatively damp and mild, I’m able to indulge my love of rhododendrons (we have a couple of hundred now), hydrangeas and aspera (only about a hundred), roses (about fifty) and all manner of what one would call “English Country Garden” plants, like columbine, hostas, rudbekia, day lilies and lots of beautiful trees – we’ve planted about a hundred since we moved here ten years ago. My husband is a great hole-digger, whereas I enjoy ripping at the weeds while I plot! CA: Well, they are always both pretty well stocked…but if I look as though I’m running out of any of these four things, I panic! Champagne (not necessarily Veuve Cliquot, which is my #1 choice and reserved for special occasions, more often than not it’s Cipes – a sparkling wine made using the champagne method by Summerhill Wines in the Okanagan), butter (salted for eating , and cream for baking), eggs (scrambled on toast, poached and tossed onto salad leaves, or to make an omelette/frittata, they are the perfect ‘go-to’ food) and, currently, my obsession is Nona Pia’s Merlot Cabernet balsamic reduction, made in Whistler, BC…wonderful on anything from strawberries to steak! CA: In spring 2014 Cait visits Pacific coastal Mexico in THE CORPSE WITH THE EMERALD THUMB, and I’m currently writing the fourth book in the series, due out in the fall of 2014. There’ll be two more Cait Morgan Mysteries in 2015. CA: I get to work at home, with my dogs (two chocolate Labradors) at my feet – which is exactly where they are now! CA: You’re very welcome – thanks for having me! Want to learn more about Cathy Ace? Check out these links! I'm currently reading The Age of Miracles by Karen Thompson Walker. This book was one of my birthday gifts from my friend Trish in Sheffield, UK. It's not a cozy mystery. It's a unique story about Julia, an 11 year old girl in California. Her world is about to change-actually the whole world is changing. The rotation of the earth has slowed. Days are becoming longer and no one knows why. It's a very interesting story that is quite captivating! A Visit with Daryl Wood Gerber and Giveaway! I'd like to welcome Daryl Wood Gerber to the blog today. Combining cookbooks, murder, and an adorable kitten, Daryl brings us Final Sentence, the first book in her new mystery series, A Cookbook Nook Mystery series. 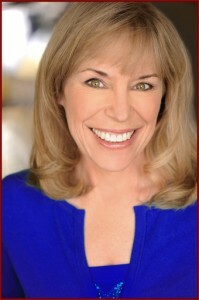 You may know Daryl as Avery Aames, author of the Cheese Shop Mysteries! Kathy: I love cookbooks! In fact, I collect them. I love all kinds, but particularly "vintage" ones and those written by groups as fundraisers. However, I rarely cook from them. Do you collect cookbooks, and if so, do you actually use the recipes in them? DWG: I don’t collect cookbooks, but I do have a bunch of cookbooks. I mainly purchase cookbooks because I see a recipe I “have to have” and possibly a picture or two. I just bought a cookbook about peaches. I adore peaches! This has grilled peach recipes and all sorts of things I wouldn’t have considered. Kathy: I'd love to visit the Cookbook Nook. Is your shop based on a real store, or is it a dream store? DWG: I was invited to a booksigning in Occoquan, Virginia at a culinary bookshop called Salt and Pepper Books. I walked in and knew it was where I had to set my new series. The shop is/was darling--was because the owner has been enticed to move to a bigger store with lots more foot traffic at the National Gallery in Maryland. I can’t wait to visit! She sells lots of culinary mysteries. She has darling doodads and kitchen knickknacks. She hopes to offer cooking classes. And yes, she hopes to reopen the smaller store when the larger hits the big time. I’ve added a café to “my” store because I really wanted to offer those cooking classes early and have someone in Jenna’s world who was fabulous cook—enter Katie! Kathy: What type of cookbooks do you like best? DWG: Sweets. End of story. I adore sweets! Pies, cookies, cakes. Oh, and breads. I have gluten-free cookbooks for these types of foods, too, since I have to eat gluten-free. Kathy: Jenna is just learning to cook. How would you rate yourself as a cook? DWG: I’m pretty good. I’ve been cooking all my life. When I was a girl, I sold chocolate cream pies around the neighborhood. I remember making tons of pies during my teen years. We had fruit trees and berries on the vines. I worked as a caterer, and I waitressed and managed a restaurant. Cooking is where I find my calm. I love to experiment. With Jenna, however, I wanted to introduce a character who is just learning. Many of my fans aren’t cooks. They’re foodies. Jenna loves food, but her mother did all the cooking as she grew up. [This happened to my mother. She became a terrific cook, but she didn’t start until after she graduated college.] She’s on a learning curve. Kathy: I love the way in that Tigger enters Jenna's life. Have you had an animal enter your life that way? DWG: We found Angel, our sweet hound/shepherd mix (rest her soul) at the park. She was all skin and bones. She approached us and fell in love with my son. She followed him everywhere. She wasn’t wearing a collar. We asked around the park, but no one claimed her. We already had a golden retriever at home. We took Angel with us, and the deal was she could stay if Barney got along with her. Barney took her in like a champ. He adored her. They were best buds for a long time. When Barney passed on, we went to the pound and found Max, another mutt. Same deal. Now Angel was top dog, so she had to like Max. It was a tough road. She didn’t want to share us…until, two weeks into his stint, he started licking her ears. Oh, man, she was toast after that. They became best buds for umpteen years. They are all in heaven, and we’re just about ready to meet a new friend. DWG: I grew up reading Nancy Drew and Agatha Christie books, mainly Hercule Poirot stories. When I turned to writing, I started with mysteries, but I also tried my hand at thrillers. I love both genres. I ultimately turned to cozy mysteries because my publisher gave me an opportunity to write The Cheese Shop Mysteries. I love creating a small community. I love writing about an amateur sleuth and figuring out how she becomes embroiled in a mystery. I enjoy plotting how she works with the police and how she finds her own path to the truth. DWG: Yes, I write thrillers. I’m reworking a couple I have previously written and hope to see them published in the future. DWG: Final Sentence, the first in A Cookbook Nook series, features Jenna Hart, a former advertising executive who returns home to Crystal Cove, California to help her aunt open a culinary bookshop and café. Jenna, who lost her husband two years ago in a boating accident, seems to have all the right ingredients for a fresh start—until someone adds a dash of murder. As a marketing expert, Jenna wants to make sure the grand opening of the Cookbook Nook draws a crowd, and no one is better at getting attention than her old college roommate, celebrity chef Desiree Divine. But when Desiree arrives in quiet Crystal Cove to do a cookbook signing, the diva stirs up more trouble than business…especially when she turns up dead. I also write The Cheese Shop Mystery series, which features Charlotte Bessette, a cheese shop owner in the quaint, fictional town of Providence, Ohio. [Just so you know, Crystal Cove is also fictional – north of Monterey, south of Santa Cruz]. In the very first Cheese Shop mystery, The Long Quiche Goodbye, Charlotte’s grandmother, the woman who raised her, is accused of murder. How can Charlotte not get involved? Kathy: Do you have a favorite character in your new series? If so, who and why? DWG: I adore Jenna. She is sassy and plucky. She loves her family and friends. Although she has been hurt and had a lot of loss in the past few years, she still has a sense of humor, and she is ready to explore. I want to see her thrive. She is willing to learn how to cook. She takes in a wayward kitten. She attacks her new project with enthusiasm. That said, I love all my other characters. Aunt Vera is a hoot. She has quite a history. She’s independently wealthy. And she loves to tell people’s fortunes. Does she have a gift? That’s yet to be seen. DWG: I wanted to set the series where I would like to live, the beach. I grew up in California, and the coast of California has some of the most beautiful stretches of land. In addition, I wanted to build a world that had stores and restaurants that I would like to visit. I wanted the town to feature events that would lure tourists. DWG: Every author wants to be published. I didn’t decide, however. My publisher did. I wrote for a lot of years before being published. I took classes. I participated in critique groups. I wrote screenplays, as well, and created the format for a successful TV show, Out of this World. DWG: Only 4?? Will Shakespeare (we would all call him Will), Mark Twain (should we call him Sam or Mark…up to him), Hilary Clinton (I’ve heard she’s a fabulous raconteur), Katherine (Kate, definitely Kate) Hepburn. I think we would hear some great stories, some great gossip. We’d laugh; we’d be inspired. I would want to make sure that a superb chef was on board for the event. Maybe Anthony Bourdain or Anne Burrell? Bobby Flay would be fun, too. DWG: I love to cook, garden, and do amateur photography. I take pictures of trees. I also love to swim and walk. Exercise is vital for me to keep my mind churning with ideas. DWG: Cheese, eggs, fruit, brown sugar. I love brown sugar! If I can add a few more items, I’d include gluten-free flour and chocolate so I can make sweets! DWG: Yes. I am writing three for A Cookbook Nook series. Next up is Inherit the Word, out March 2014 then Between a Book and a Hard Place, out October 2014. I am signed to write a total of seven for A Cheese Shop Mystery series. Next up is Days of Wine and Roquefort, the 5th in the series, out February 2014. And, as I said, I’m polishing a thriller I’ve been working on. I’m hoping that will land a publishing contract, too. DWG: Writing. Creating. Living with characters in my head that often “talk” to me. It’s total fun coming up with ideas. I never feel like my brain takes a rest. Something in normal life will spark a new idea, a new character, a new bit of dialogue. I love that! I love when writing comes freely. It’s hard when it’s a rear-in-chair day, but the work gets done. Also, I love hearing from readers who enjoy my books. What fun it is to know that I’m entertaining readers! Would you like to win a copy of Final Sentence? If you live in the US (sorry, only US addresses this go around) just leave a comment by 11:59 EST tonight (July 14) and I'll use random.org to pick a winner. Please leave your e-mail address so that I can easily contact you. I'd also love it if you were a follower of this blog and a fan of its corresponding Facebook page. Thanks and Good luck! I'm currently reading Tarnished and Torn by Juliet Blackwell. This book, the 5th of the Witchcraft Mysteries, was just released last week. I cannot praise this series enough. I love the characters, the mysteries, the hints of romance, the humor, and the legends behind the stories! I don't know if I could ever name my ultimate favorite series, but if asked the question, this series would be one I'd always mention! In this outing Lily Ivory attends a gem festival, only to find trouble of a possible demonic nature. There's a murder, committed in the manner of witch hunts, and the surprise of the presence of her estranged father. I can only hope to learn more about Sailor-the end of the previous book left me stunned. And, of course, I want more Oscar! This week saw the release of Laced With Poison. 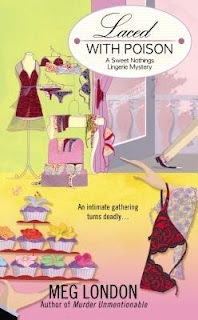 This book is the second entry in the Sweet Nothings Lingerie Mystery series by Meg London. I'm currently reading Final Sentence by Daryl Wood Gerber. This book is the first in the Cookbook Nook Mystery series and was just released yesterday! Young widow Jenna Hart returns to Crystal Cove, California to run The Cookbook Nook, a store specializing in, you guessed it, cookbooks! In addition to cookbooks, the store sells culinary mysteries, and various food related items. It also has a cafe. I'll tell you this-I want to go to that store!!! Add an adorable kitten and this is one book that shouldn't be missed. Stay tuned. On July 14th I'll be posting more information about this book! In case you didn't know, Daryl Wood Gerber is also Avery Aames and writes the Cheese shop Mysteries under that name!